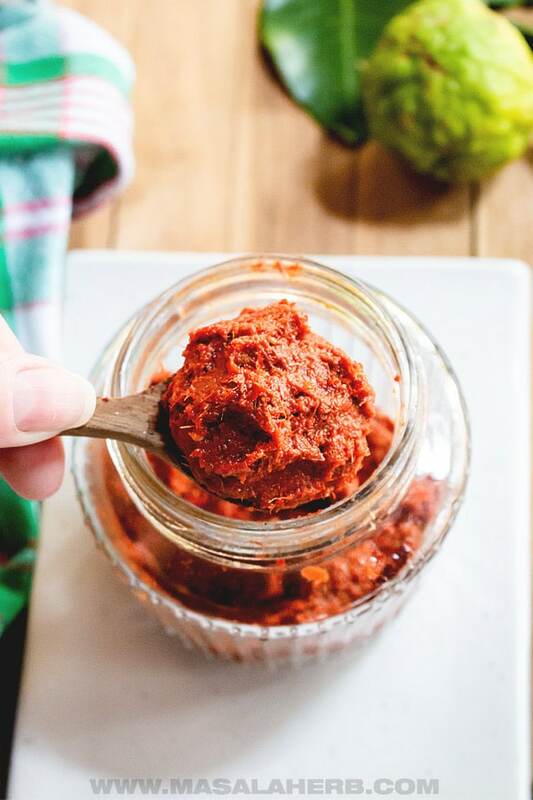 Quick 5 minute Thai Red Curry Paste Recipe – Use this easy small batch DIY paste recipe to prepare homemade Thai curries such as the Thai shrimp red curry or simply add some Thai elements to create fusion meals. This Thai curry paste is mainly prepared with whole fresh ingredients. The curry paste includes authentic exotic Thai ingredients such as Galangal, Kaffir Lime and Thai Shallots. Read below on how to substitute. Thai red curry paste is a basic wet blended Thai paste, which is prepared with common fresh ingredients in Thailand. The traditional way to prepare the paste is to pound all the ingredients in a mortar and pestle. This can be quite a laborious job. Those pastes are used to prepare traditional curries with beef, duck, pork, chicken, shrimp and other seafood. Yet, the red curry paste is more often also used as a way to add flavor in fusion meals or creative international food dishes. This easy Thai red curry paste includes authentic Thai ingredients. For ways to substitute read further below. 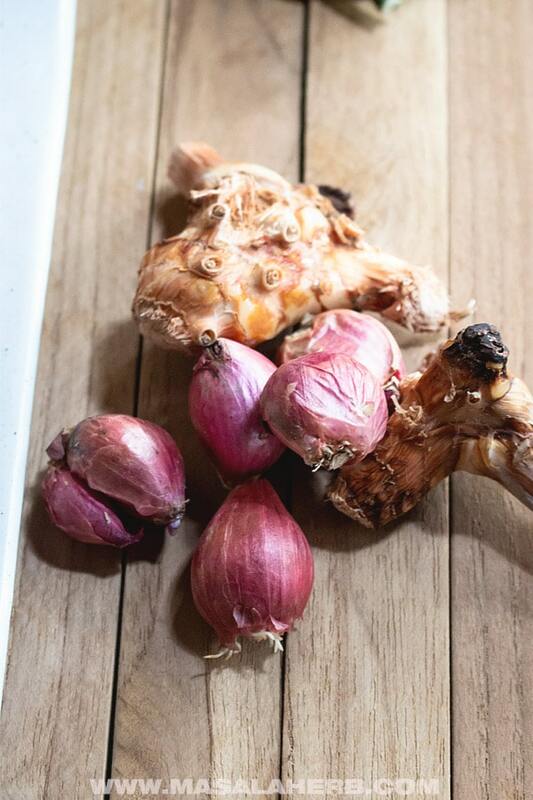 Galangal, aka Thai Ginger, lends the Thai red curry paste the pine-like fresh aroma which I treasure. The galangal in this recipe needs to be as fresh as possible because the older it gets the tougher it gets. Galangal is also the main ingredient in this paste and should not be confused or substituted with regular ginger! Thai Red Chilies, called Prik in Thai, lend the paste the red color and spicy flavor. The chilies have to be dry but you can pick which common Thai chili variety you would like to use, depending on the heat amount in your Thai curry paste. I used a combination of smaller and bigger dried Thai red chilies. Thai Shallots are mild and small and resemble big purple garlic bulbs. They give the curry the basic flavor undertone. 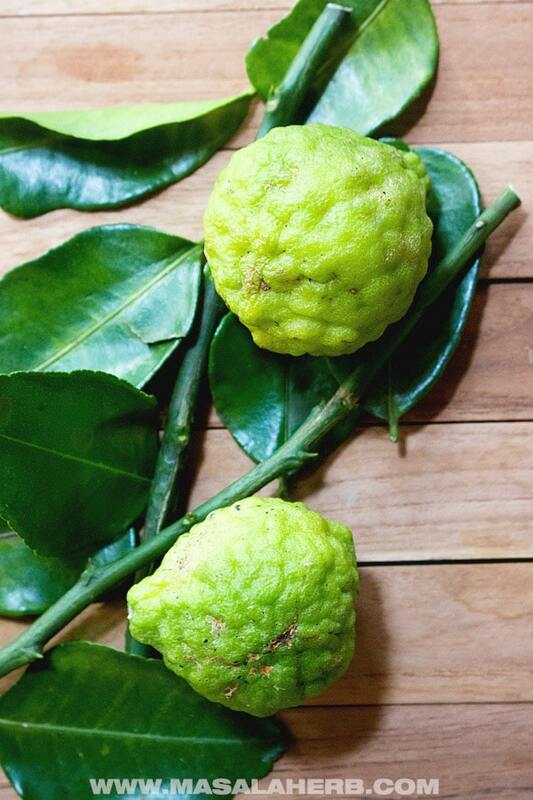 Kaffir Lime skin will give the fresh punch that your red Thai curry paste needs! Get organic untreated kaffir limes if possible because you don’t want poison in your skin. The skin is cut off the lime and used in the paste. Lemongrass adds another refreshing aroma to the red curry paste. Make sure to only use the white soft parts because the green leaves get stringy and are not suitable for the curry paste. Cilantro Roots are an optional addition but one which I don’t miss. The roots give another base flavor to the red curry paste. It’s not that overpowering compared to cilantro leaves. Shrimp Paste is a fermented Thai paste made with tiny shrimps from the region. This is my ultimate secret ingredient in my Thai red curry paste. To make your Thai curry paste vegan, skip the shrimp paste. Black Pepper is one of the two spices in this curry paste, together with Cumin Seeds. Thai curry pastes, compared to Indian curry pastes, don’t focus on spices but rather on fresh citrus ingredients. Salt helps in preserving the paste too. You can use sea salt here for the best result. NEVER add water to the curry paste! Water will reduce the shelf live and will turn the paste moldy quickly. This would beat the purpose of preparing your own Thai red curry paste. Where to get fresh Thai food ingredients? Usually, you can get galangal, kaffir limes, lemongrass and Thai shallots in your friendly neighborhood Asian grocery store in most of the major cities anywhere in the world. I get mine in Europe when we visit Munich, Prague (you get really good shrimp paste there! ), Zurich or Salzburg. Or make a visit to Walmart or Carrefour, Supermarkets in countries such as the US, UK, UAE or France always carry these fresh ingredients. Another idea is to buy fresh Galangal, Thai shallots and kaffir limes on Amazon online. You can get other ingredients there as well such as the Thai shrimp paste. Another idea is to simply travel to Thailand, as we did recently again when we visited Ayutthaya. You can pack the fresh ingredients into your main suitcase. How to substitute certain Thai ingredients? Try to not substitute the Thai ingredients if possible because the taste of the red curry paste can turn out entirely different! However, if you can’t help it and you still want to make this paste then substitute the following ingredients. Galangal – you can’t substitute galangal. Never use ginger and galangal interchangeably, both have very different flavor profiles (although galangal is called Thai ginger)! Shrimp Paste – No substitute, leave it out if you can’t get it. 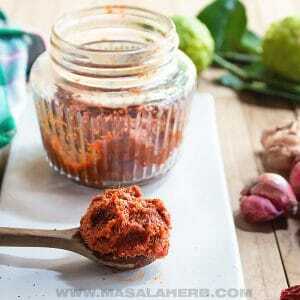 How to make Thai red curry paste? To prepare your own small batch easy Thai red curry paste simply follow the video or recipe instructions further below. You can double the recipe ingredients to make a bigger batch. The quickest and easiest way to prepare the curry paste is to blend the paste in a blender. In Asia you get those electronic stone grinders, those are great too to prepare homemade curry pastes. Otherwise, you can get in shape too by using the good old mortar and pestle. How to store the Thai Red Curry Paste? Keep a sterilized Jar with a lid ready. The jar size should suit the amount of curry to fill up the jar, that way no air gets formed in the jar, which in turn would reduce the shelf life of the curry paste. Store the curry paste in the fridge in the coolest compartment. Don’t keep it for too long because the paste will get hard otherwise. Another idea is to fill up a vacuum pouch with the paste. That way the paste tends to not get hard and remains nice and soft in the fridge for over a longer period of time. 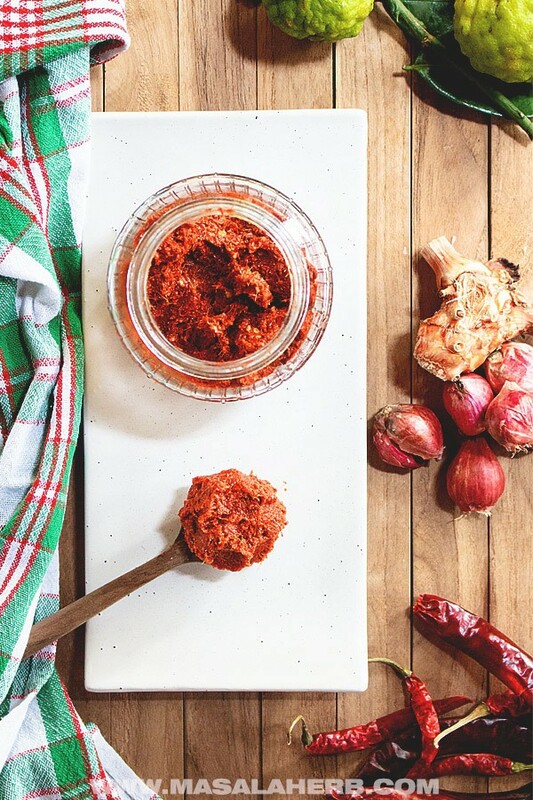 Homemade DIY Thai Red Curry Paste. Used in Thai chicken curry or shrimp red curry. Prepare your own red curry paste within 5 minutes! Keep the red dried chilies to soak in water, that way they will easily blend with the other ingredients. Strain when you are ready to prepare the paste. Keep all your fresh ingredients ready. Peel and cut smaller shallots, garlic and galangal, cut small lemongrass and cilantro roots. Cut the lime skin from the lime. Add to your blender jar all the fresh ingredients with the red chiles (without water!) and add the cumin, black pepper, and salt as well as the shrimp paste. All ingredients should be added to the jar at this point! Blend everything to a smooth wet paste. Do not add water to the paste, because water reduces the shelf live and the point of the paste is to keep it for a while. Store paste in a clean sterilized jar or in a clean vacuum bag until further use. 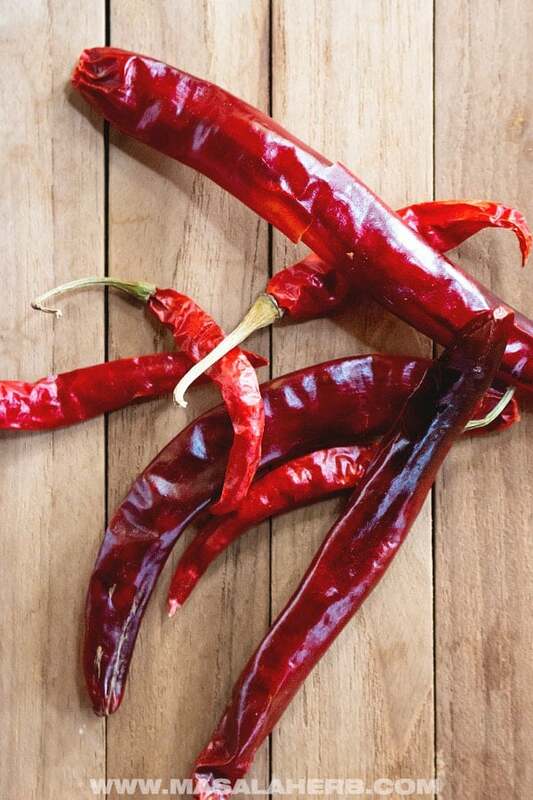 For the Chili Pepper use Thai varieties from your Asian grocery store or your favorite pepper variety. For ingredients substitutions see post for all the details. You can add Shrimp Paste, as it turns out more flavorful. However, you may skip it if you can't get Shrimp Paste. Dear Reader, How are you planning to use your homemade red curry paste? Hi, this may be interesting you: 5-Minute Thai Red Curry Paste Recipe!